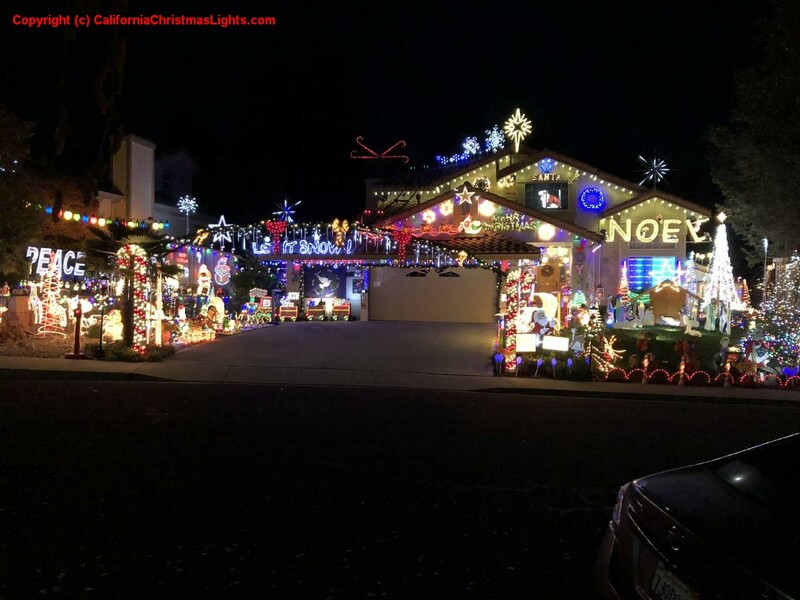 BEFORE YOU SUBMIT YOUR HOUSE ASK YOURSELF: Do your neighbors have to wear sunglasses to keep the glare from your Christmas lights from burning their eyes? Does your neighborhood display burn so brightly it can be seen from the International Space Station? If you answered yes to either of these questions, and want your fellow local residents to get a load of your holiday spirit, here's your chance to shine. 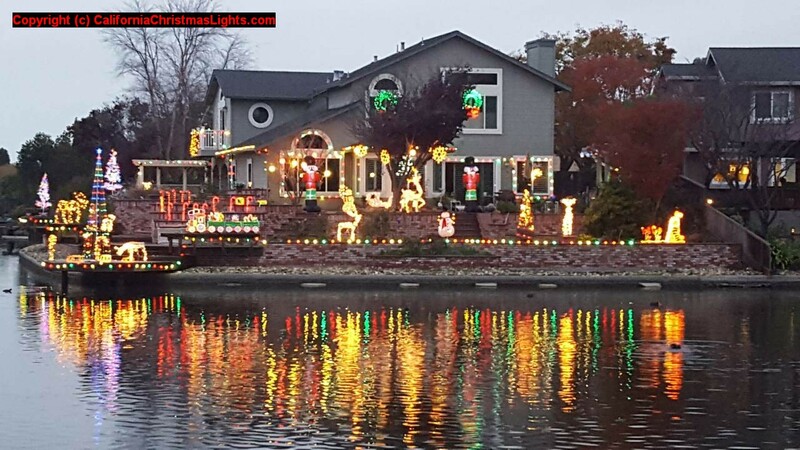 California Christmas Lights is designed for showing holiday decorations in California that are unusual, elaborate or decorated beyond the traditional strings of lights or simple decorations. Not every house that is submitted will be accepted / displayed. Please, do not be offended if you submit your house and it's not used. Before you submit your house, READ THE SUBMISSION RULES below about photo size, etc. THINK OF YOUR SUBMISSION AS A RESUME FOR A JOB !! Do not send photos smaller than the required minimum size stated below. DO NOT SEND BLURRY PHOTOS. I must have photographic evidence of an impressive, and perhaps 'over the top' display before I add an address to the website. Your photos are the first and ONLY impression I will have of your display and WILL make all the difference in the world about your display making it onto the site or simply being deleted. 1. Read the Privacy Statement before you submit your house. 2. Include your name, the full street address, city, state, zip code, county of the house or property displayed. 3. 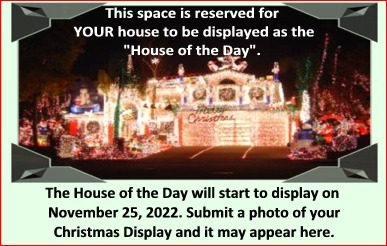 Include a detailed description about the display - what the display is about (elements, themes, # of lights, etc) - hours of operation, date the display opens this season and date the display closes. 5. Don't forget to send us the digital photos !! Submissions without photos will NOT be considered. AGAIN... THINK OF YOU SUBMISSION AS A RESUME FOR A JOB !! Your PROPER SUBMISSION (photos, description, address / contact information, etc) is the first and ONLY impression I will have of your display and WILL make all the difference in the world about your display making it onto the site or simply being deleted WITHOUT reply. 1.Photos MUST be least 1280 pixels wide - nothing smaller will be accepted or acknowledged. 2. Your submission should include 3-6 photos including 'overall display', different angles and close-ups of various features. 3. All photos MUST be taken in Landscape mode. 4. DO NOT send blurry photos, or photos taken in complete darkness, unless a time exposure is used. 5. Each photo MUST be under 4 megs in file size. 6. No more than 10 megs total per email - you MUST send multiple emails spaced a couple of minutes apart so the servers between you and me don't get bogged down. 7. Do NOT send photos embedded in email, send all photos only as attachments. 1. Do NOT send videos to me! If you want your video to be added to your listing, post it to YouTube and send me the link. HINTS: The "Best" photos are taken at dusk - before its completely dark. Always use a tripod. Use the self timer to eliminate camera shake. Do not use the flash. Try several different shutter or timing modes. PHOTO TIPS: How to take better night photos.